I had a few hours to spare tonight and I decided to do a quick check of the WBX receiver. Didn’t have time for much so I just compared it to the TVRX tuner using a strong FM broadcast station. The software was a simple WFM receiver constructed in the GNU Radio Companion graphical editor. As you can see, both receivers have roughly 40 dB SNR, though the WBX seems to be slightly better. I also observed that the WBX has a “flatter” spectrum profile than the TVRX in particular at wider bandwidths. I made good progress with the portable S-band ground station this week. I took the receiver to the OZ7SAT lab to measure its performance. Using the USRP+DBSRX and no LNA we could easily detect a -132 dBm CW signal with modest FFT integration (fraction of a second) in a GNU Radio spectrum scope. Using the LNA we could go down to about -138 dBm, i.e. an improvement in SNR of 6 dB. These figures were measured at an SNR ~5 dB. This is excellent, but please note that this is not real “sensitivity” in the traditional sense because we were not demodulating or decoding the signal. We were simply integrating the spectrum for a fraction of a second to detect the presence of the signal. The measurements were done by sampling a 250 kHz wide spectrum. In this new video blog I am introducing a new project that has kept me occupied for a few weeks now: A low cost S-band ground station for receiving signals from NASA’s lunar spacecrafts LRO and LCROSS. More info at Receiving LRO and LCROSS. 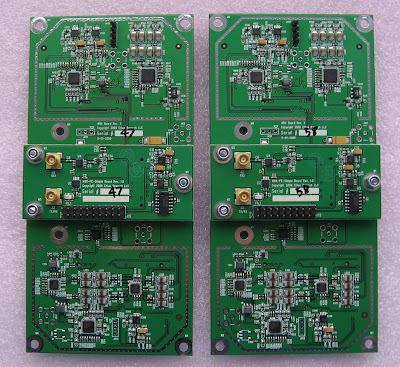 Based on the Universal Software Radio Peripheral (USRP) with DBSRX daughterboard, a super low noise preamplifier from Kuhne and GNU Radio software.